Manager Bruce Bochy of the San Francisco Giants relives Ty Blach #50 in the sixth inning against the Chicago Cubs at Wrigley Field on October 8, 2016 in Chicago, Illinois. CHICAGO — Jeff Samardzija was drafted by the Cubs a decade ago, so he spent his early years in professional baseball dreaming of starting a playoff game at Wrigley Field. On the eve of that opportunity, Samardzija said he was not nervous about returning as a visitor. Only Samardzija knows if the location Saturday night, historic Wrigley Field, with a lathered-up crowd waiting to watch him fail, played into the result. Only he knows if he was truly nervous, or overly amped. 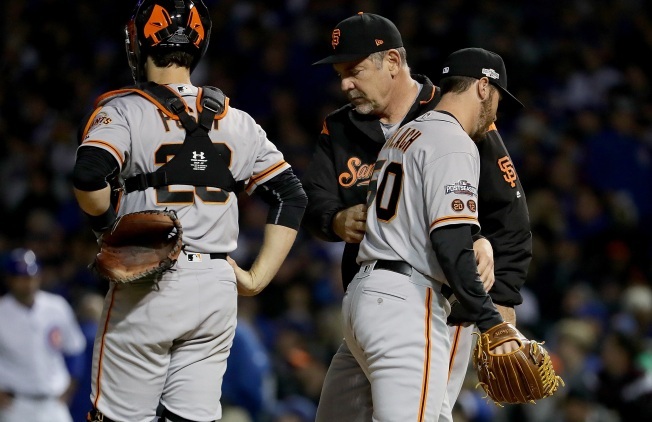 The only thing clear from the outside was that the choice of Bochy backfired horribly for the Giants, who picked him and slotted Matt Moore in for Game 4. Now, they have work to do just to guarantee a start for Moore. Samardzija recorded just six outs as the Giants went down 5-2 in Game 2 of the National League Division Series. They face a monumental task. They must go home and twice beat the best team in baseball to keep their season alive and force a return trip to Chicago. Samardzija, who pitched seven seasons for the Cubs, had a brutal return to Chicago on Sept. 1, but he was Bochy’s hottest starter the rest of the month, leading to the postseason assignment. Dexter Fowler led off that regular season game with a 13-pitch plate appearance, and he doubled on the ninth pitch of the bottom of the first Saturday. Samardzija appeared to settle in, getting a harmless groundout from likely MVP Kris Bryant and throwing a wicked splitter to whiff Anthony Rizzo. Ben Zobrist finally got Fowler across with a single to shallow right. The second inning spun on Samardzija in a hurry. Jason Heyward led off with a hard double and Javier Baez, who drew just 15 walks in the regular season, got a free pass. Willson Contreras singled, loading the bases for right-hander Kyle Hendricks, who had two RBI all season. He hit a flare to center and Denard Span’s rush came up short. Heyward walked home and Baez, who made a tremendous read, was hot on his heels. The Cubs went up 4-0 when the ball popped out of Hunter Pence’s glove on a diving attempt in right. Hendricks, the NL ERA leader, didn’t allow more than four runs in a start all season, but the Giants quickly cut the deficit in half. Joe Panik led off the third with a double and Gregor Blanco — hitting for Samardzija — followed up with a second one. The hit was the first since August 20 for Blanco, who missed most of September with a shoulder impingement. He scored on Brandon Belt’s sacrifice fly. Samardzija was charged with four earned on six hits in two innings. The Cubs also reached into their bullpen early, but not because Hendricks was struggling. Angel Pagan hit a liner that glanced off Hendricks’ forearm and knocked him out with two down in the fourth. Hendricks was diagnosed with a right forearm contusion. George Kontos and Travis Wood took over, and the Cubs’ lefty pushed the advantage back to three with a long solo shot to left in the bottom of the fourth. Wood joined Rosy Ryan of the 1924 Giants as the only relief pitchers to homer in a postseason game. Wood has nine career homers in the regular season, but the Giants countered with their own slugging pitcher in the fifth. Madison Bumgarner had peppered Waveland Avenue with homers during batting practice, and he pinch-hit for Kontos. Bumgarner smacked a grounder to third that went for a two-base error but he was stranded. The Cubs made one of the biggest splashes of the deadline with the acquisition of rocket-armed closer Aroldis Chapman, but under-the-radar moves built a bullpen armed with depth. It showed after Hendricks departed. Wood, Carl Edwards and Mike Montgomery carried the lead into the eighth, when Hector Rondon entered after a one-out single from Brandon Belt. Rondon blew a 96 mph fastball past Buster Posey and got Pence to ground out to second. The three-run lead was carried all the way to Chapman, who closed the Giants out for the second straight night.